"Everything you need to know about the South China Sea conflict" is the first article related to series of our writing about geopolitical issues that have the sensitivity and potential to outbreak a great war in the world. South China Sea issue basically dispute regarding the maritime territorial control of the greatest sea of the world that is one of the major trade routes of the world and likely resource-rich as well. 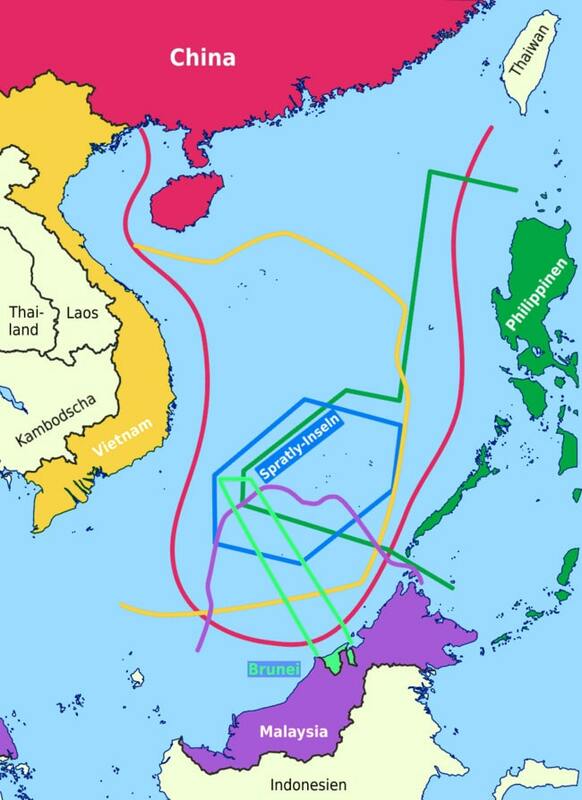 This maritime boundary delimitation dispute is between the countries around the South China Sea and countries that have interest due to its importance like US and Japan. First, we shall dig into the geography of the area to get the better understanding. The sea is part of Western Pacific Ocean. South China Sea is one major part of China Sea where another one is East China Sea. It is surrounded by China, Philippine, Malaysia, Brunei, Vietnam and Taiwan. On its west Bay of Bengal lies (largest bay of the world). Strategic significance of the Asian security paradigm and to global stability. China claims to use and discovery of these islands goes back to second century AD, till 1947 it claimed the area with eleven dashed lines U shaped area which it replaced with 9 dash lines in 1949. This U shaped area covers about 90 percent of the area. 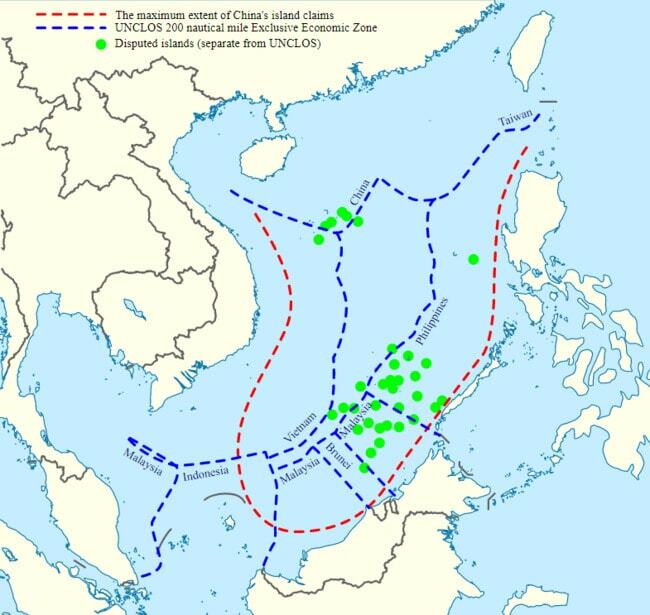 China claims more than 80 percent of the sea, quite far (more than 200 nautical mile limit) from the mainland of China as you can see on the map. The other Far East (South East Asian) countries that have rival claims are Philippine, Malaysia, Bruin, Vietnam, and Taiwan. Five of the countries involved in the issue China, Philippine, Malaysia, Brunei, and Vietnam are members of ASEAN, which is only Asian true economic cooperation organization. Coming back to the point, how China claims to such huge and far area, In fact, there are different islands in this area that goes too far south of the sea. China extends its territorial claim based on its control on these islands The four main islands involved in this maritime boundary disputes is are the Spratly Islands, Scarborough Reef/Shoal, the Paracel Islands and Natuna Island. What is the South China Sea conflict? So now the question arises why china’s claim is disputed, there are multiple aspects of it. a) First is the china control on these islands is not non-controversial. Vietnam (it had a war against China in 1980 and against the US during the third quarter of 20th century) has the second major claim. As per Vietnam, it was ruling over Spratly and Paracel Islands since the 17th century and they have legal proof regarding it. Philippine claims on its nearly Spratly and Scarborough islands. Malaysia claims territorial water claim near its boundary and some islands of the Spratly group. Brunei only wants control of the sea near its boundary. Taiwan claim is about similar as Chinas as it considered itself as legitimate China!!!. b) Second according to UN most of the islands do not satisfy the conditions need to be met for being eligible for EEZ (islands which cannot sustain human inhabitation or economic life at their own can merely be classified as rocks & can’t avail 200 nautical mile marine territory claim, most of the South China Sea’s reefs and atolls fall in this category). China also creating new artificial islands there which also are not eligible for EEZ and it also further aggravating the dispute. Though Philippine, Vietnam and Taiwan were building the island there for decades but China just leave their collective presence (number of islands and military presence) within one and half year it started. US, Japan and South China Sea's surrounded countries welcomed the verdict whereas China denounces the verdict null and void saying tribunal was partial, there are the historical precedents in which some powers just neglect the PCA rulings and said that PCA has no jurisdiction in this matter. Moreover, PCA has no authority to enforce its decision as PC is not a court but intergovernmental body. Taiwan also rejected the ruling. China is intended to get sort the issue using bilateral negotiations as it does not want to ruin its relationship with ASEAN countries and for sustaining its long-term ambitions like maritime silk road, one belt one road and AIIB. This intention can’t be taken as China would withdraw from its claim. China is increasing its military presence in both natural and artificial island in the Sea. On 17th of January 2018, a US Navy destroyer (warship) conducted a freedom of navigation operation (FONOP) near the Scarborough in the South China Sea, this has been seeing as alarming and challenging not only by China but other ASEAN countries as well regarding their maritime claim. According to Chinese, they warned the U.S. vessel to leave after verification. China's Foreign Office took it as a violation of their sovereignty. China is taking such US movements as the pretext for its militarization. On the other hand, US is not taking China's increasing military deployments as defensive measurements. A U.S. Navy aircraft carrier is expected to make a port visit to Vietnam in March first time since Vietnam war. The US also likely to resist China increasing power and influence. So though the war is not unavoidable, the area remains the flashpoint as in the near future no win-win solution is seeing being implemented. We hope that you like this 'South China Sea Conflict', stay tuned for more to come.